The Clevedon Pier Company issued a prospectus in March 1867. Designed by J.W.Grover (1836-92) and R.J.Ward (1817-81), this unique structure used discarded wrought iron railway lines formed into eight, 100 ft arched spans standing on trestles of the same material. The pier is 842 feet long and 48 feet high, to accommodate the wide local tidal range. It opened on Easter Monday, 1869. 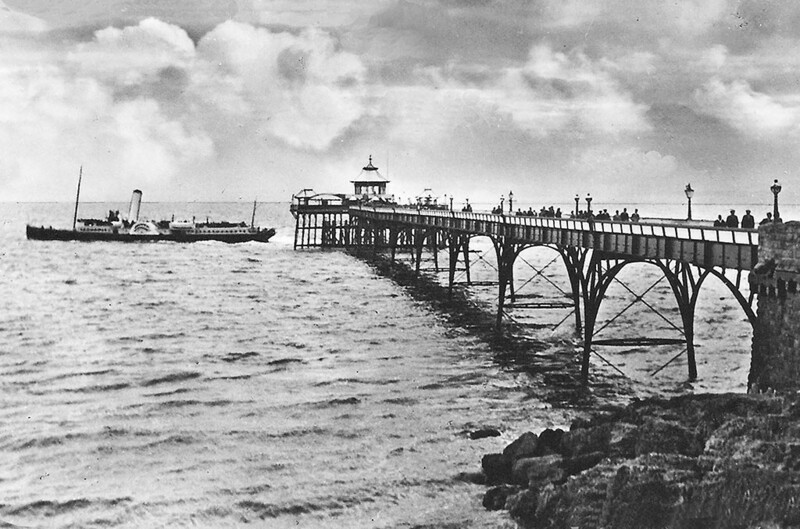 In 1891, due to the pier’s high operating costs, the major shareholder, Sir Edmund Elton, Bart., bought all remaining shares and donated the pier to the local council. In 1892, the original wooden pier-head was replaced with a cast-iron structure, angled to the pier-neck to align with tidal flows. Ornate, cast-iron buildings were added in 1894. From 1952, safety concerns led the council to sub-contract regular testing for insurance purposes. On October 16th 1970, during testing, two spans collapsed. The Trust became a company limited by guarantee and restoration began in May 1982. In 1983, a structural survey led to a £500,000 award from both the Heritage Memorial Fund and the Historic Buildings & Monuments Commission. In 1985, the pier-neck was dismantled and restored at Portishead. It was re-erected during 1988 and re-opened on 27th May 1989. In 1995, a Lottery grant enabled full restoration of the pier-head and landing stage. 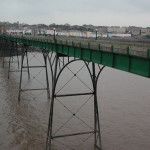 Work began in May 1997 and, on 23rd May 1998, the pier was re-opened by Sir Charles Elton, Bart., great-great-grandson of the Chairman of the original Clevedon Pier Company. Full restoration had cost £3.2 million, raised through local fund raising, and with major grants from District and Town Councils, the Heritage Memorial Fund, the Monuments Commission, the National Lottery and others. 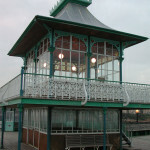 The pier won a Civic Trust Award in 1999 and in the same year was named Pier of the Year by the National Piers Society. In 2001 its listing was upgraded from Grade II* to Grade 1. Clevedon’s pier plaque scheme has become hugely successful with thousands of plaques now having been sold. In December 2009, a notice was served on the owners of The Royal Pier Hotel adjacent to the pier forcing them to carry out about £40,000 of urgent work to protect the building. But then, in the same month, the pier was put up for sale by its owners, Royal Pier Hotel Developments and in January it was announced that the pier had been purchased by Bristol-based Freemantle Developments. MAJOR planning applications for both Clevedon Pier and the Royal Pier Hotel were submitted to North Somerset Council in November 2010, following months of work between the Clevedon Pier and Heritage Trust, the hotel owners, Freemantle Developments, and many community groups. The plans included the conversion of the derelict Grade II-listed hotel into luxury residential accommodation, and new modern visitor facilities created at the land end of Clevedon Pier, with toilets and dedicated education, exhibition and refreshment areas. Then in April 2011, the plans for the futuristic £1m visitor centre to be built on the ramp leading to Clevedon’s Grade I-listed Victorian pier were approved by North Somerset Council. An appeal to help pay for the development was launched with the hope that work could begin in spring 2012. A glass-fronted educational centre looking out towards the Bristol Channel and built under the ramp was included together with a refreshment area and toilet facilities. January 2012 saw the bid to the Heritage Lottery Fund for more than £675,000 to help pay for the new visitor facilities on the Grade I-listed pier approved at the first assessment stage to go on to the final stage, with a decision due in September. But the pier was now overdue for essential maintenance work to be carried out and so in June 2012 North Somerset Council agreed to provide £650,000 towards the £797,601 needed to fund the repainting and renovation work. 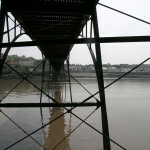 The remaining amount would be covered by the Clevedon Pier and Heritage Trust. The complete work was estimated to continue until February 2013 and would include the condition of the pier’s legs being checked and then blasted and repainted, some of the work having to be carried out at low tide. Further fund raising activities in support of the new visitor centre continued throughout the summer of 2012 and in August 2012 it was reported that, following the project’s success in its first round of scrutiny, a grant of £22,000 had been made by HLF to enable the trustees to create a more detailed bid for further funding. Second round bids to both the Heritage Lottery Fund and the Coastal Communities Fund were submitted in October 2012 and also in October Clevedon Town Council agreed allocations of £15,000 toward the project in both its 2013/14 and 2014/15 budgets, subject to the trustees obtaining all of the money needed for the scheme. Then in December 2012, it was announced that the Heritage Lottery Fund had made a grant of £720,000 to the pier trustees in support of the new visitor centre project, and in February 2013 a further £500,000 grant was made by the Coastal Community Fund, a government body set up to boost the economic development of UK coastal areas. 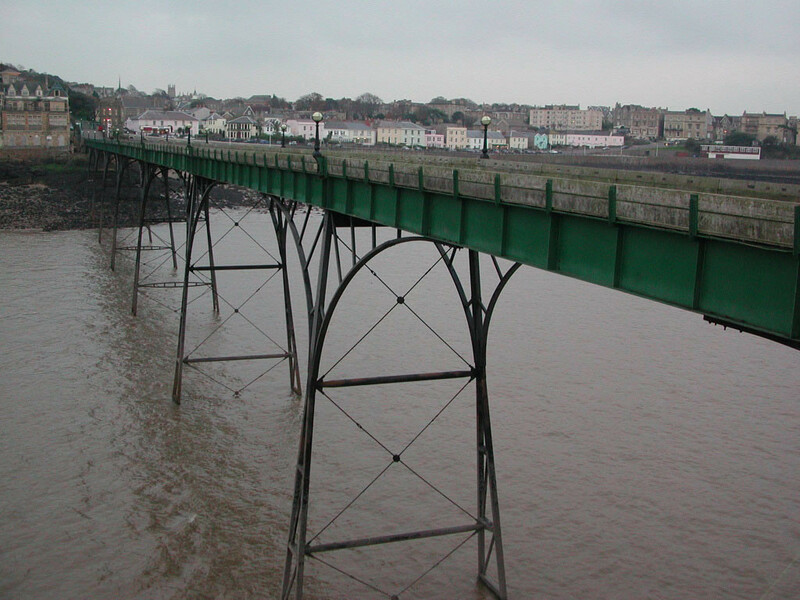 This amazingly successful period was crowned in March 2013 when it was announced that Clevedon had won the National Piers Society’s prestigious Pier of the Year award. As an indication of its strong community ethos, the Pier Trust agreed in May 2013 to take on the running of the nearby public toilets after they were closed by North Somerset Council. Also in May 2013, specially-designed steps were installed around the high-powered binoculars at the end of the pier to enable access for children, following a donation of £500 from Cotswold Homes. In August 2013, it was announced that work on building a new visitor centre on Clevedon’s historic pier could start in early 2014. The new two-storey building, designed to be built into the rock face beneath the ramp to the pier, was planned to house a tea room, new toilets, function room and exhibition space. 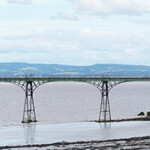 A lift and a viewing platform for people to take in the Clevedon coastline were also included. Some work would also be carried out to the Toll House to accommodate a shop, pier master’s office, interpretation and display area and staff toilets. The following August, a further £250,000 from the Coastal Communities Fund was awarded to the Pier Trust towards the new visitor centre project. This was in addition to the £720,000 already received from the Heritage Lottery Fund. 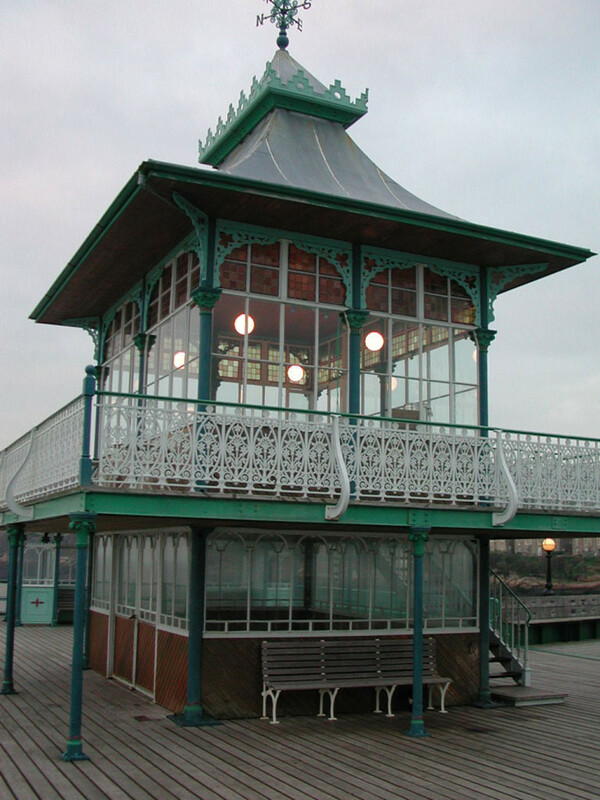 February 2015 saw the pier become an unlikely winner of a Brit Award after appearing prominently in a video for the pop group One Direction. Hysterical scenes among teenage fans of the group had taken place when they had been spotted on Clevedon Pier filming in March 2014. And the musical theme continued in April when the pier became the subject of a new musical comedy, telling the story of the pier over three different eras – past, present and future. The first section began in the Victorian age, when plans to build the pier were first announced, and the second was set at the time the pier collapsed in the 1970s. Also in April, it was announced that Linda Strong, the longstanding and very popular Pier Mistress at Clevedon, was stepping down after ten years service. Mrs Strong had played a major part in the success of the pier but had decided to move on as a result of restructuring of the pier management. The People’s Pier project, a joint study between the universities of Bristol and Brighton looking into Victorian seaside piers and how they fit with today’s society began in May 2015. Clevedon and Hastings piers featured in the study. The promise made in August 2014 to have Balmoral back sailing in the Bristol Channel in 2015 was honoured when in June 2015 it was announced that passengers would climb aboard the historic cruise vessel for the first time since 2012, after supporters had managed to raise almost £300,000 to carry out the vital repairs needed to get her sailing again. In January, a final huge boost had been given to the cause by a £344,000 grant from the Coastal Communities Fund. August 2015 saw the launch of the Clevedon Pier community share scheme in which £1 shares were offered to the public to raise funds to help complete the new visitor centre and provide upgraded facilities. A minimum holding of 150 shares was required and would convey a number of benefits to holders, including free entry to the pier during normal opening hours. £30,000 worth of shares were sold within the first week. In September 2015, it was reported that Bristol architects O’LearyGoss were forecasting a completion date for the unique £2.25 million visitors’ centre at the pier by April 2016. The new centre would include a glass superstructure at the shore end with a tea room, toilets, a function and education room, a shop and exhibition space, plus a top-deck viewing platform. In October 2015, the chaiman of Clevedon Pier & Heritage Trust, Simon Talbot-Ponsonby, praised the hugely important role that volunteers played on the pier. There were currently around 30 volunteers carrying out a variety of jobs including ticket sales, cleaning and visitor information but it was hoped to increase this to 75 over the coming years. October also saw the announcement that Querceus Design, Wide Sky Design and the Workhaus had worked jointly as the design team for the new visitor centre being constructed on the pier. In February, installation of a £300,000 glass superstructure designed by Bristol architects O’LearyGoss, part of the £2.25 million new visitor’s centre scheme, was completed. The glass superstructure at the Marine Parade end will house Tiffin Tea Room with toilets, function and education room, shop and exhibition space plus top-deck viewing platform. April 2016 – New Visitor Centre at Clevedon Pier due to open in May! In April 2016, the trustees of Clevedon Pier confirmed that the new visitor centre would open in mid May with a large ‘Seafront Spectacular ‘ celebration on May 30. The new centre had originally been due to open in February but the complexities of the project, including complications with work drilling into the rock face, led to delays. May 2016 – A fishy trail at Clevedon Pier! May 2016 saw the installation of a ‘Fish Trail’ at the Pier consisting of eight fish shaped metal plaques positioned on seats along the pier to help inform and educate visitors about the marine life living below. The new £2.25 million centre built into the rockface beneath the ramp to the pier was officially opened in May 2016.The new two storey building houses a restaurant, multi-function room and exhibition space and new toilets and the Clevedon Pier and Heritage Trust hope the new centre will bring even more visitors to the pier and secure its future for generations to come. But with the opening of the new Visitor Centre came a rise in entry fees from £1.80 to £3. Children’s entry to the pier also doubled, from £1 to £2 and a family ticket, offering entry for two adults and two children, was £9. However an annual adult pass for the pier, offering unlimited visits, remained the same at £25. May 2016 – Grand opening of Visitor Centre and re-opening of pier. The Spring Bank Holiday at the end of May saw the grand re-opening of the pier and new visitor centre, with hundreds of people enjoying the special entertainments including musical performances, a Punch and Judy show, an RNLI rescue demonstration, and a pirate and princess parade. A good time had by all. In June 2016, a new seafood restaurant operated by ‘Tiffin’, which also owns a café on the promenade, was opened in the new visitor centre. Tiffin @ The Pier offered two separate menus catering for daytime opening hours on a sit-in or takeaway basis, and a unique high quality restaurant in the evenings. July 2016 – Bollywood glamour at Clevedon Pier! Film production company Looking East Films arrived in the seaside resort at the end of July to use the pier as a location for its new movie Caroli Loves Sumit. The Victorian landmark was one of four to be shortlisted for the best community action project in Historic England’s Angel Awards. The Shipping Links feature, a new interactive visitor attraction which allows visitors to find out a variety of information about ships which are passing the pier, including a ship’s name, port of origin and destination, was installed at Clevedon Pier in September 2016. In December 2016, in an effort to raise awareness of the marine environment, Clevedon Pier and Heritage Trust created its first ever Christmas Sea Santa grotto made almost entirely of recycled items including netting, shells, and blue and green materials giving a unique new grotto for meeting Father Christmas. A new BBC ident appeared in January 2017 featuring sea swimmers in the water near to Clevedon Pier. The clip was one of a series featuring local groups from around the country to occupy the short periods between programs. January 2017 also saw the pier awarded a venue licence to hold weddings. The first ceremony was scheduled for April to be held in the Porthole Room beneath the pier. Bookings could also include use of the viewing deck and canopy which can seat up to 20 people. And in April 2017, under blue skies and bright sunshine, Nick and Emily Hall became the first happy couple to wed on the pier. Also in April 2017, the new Visitor Centre on the pier was shortlisted in the Tourism and Leisure category of the Royal Institute of Chartered Surveyors (RICS) South West Region Awards 2017. In June 2017, on the anniversary of the opening of its new visitor centre, Clevedon Pier welcomed its 100,000th visitor. The lucky visitor, Sam Hall, was presented with a free annual pass, a meal for two at Tiffin @ The Pier and a bottle of Prosecco. In November 2017, Tiffin At The Pier, based at Clevedon Pier, won the Best Newcomer prize at the Somerset Food and Drink awards ceremony held at Somerset County Cricket Club. Tiffin’s achievement meant it could go on to enter the Taste Of The South West Awards, which would see it competing with winning restaurants from other areas in the region. December 2017 – Eco-friendly Santa’s grotto at Clevedon Pier! In December 2017, Clevedon Pier’s Porthole Room was transformed into a winter wonderland where children could visit Santa to let him know what was on their Christmas list. 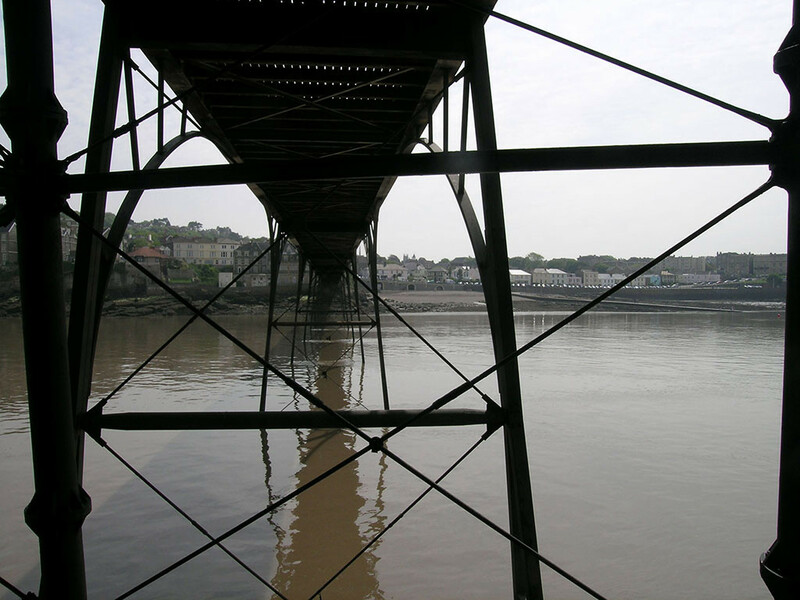 Congratulations to Clevedon Pier in securing grant to add ‘wow’ factor! Jane Austen goes to Clevedon Pier! 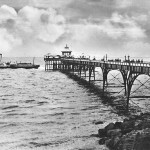 Clevedon Pier to open archives as part of 150th birthday celebrations! Clevedon Pier is a right barrel of laughs!